In our return match versus Battersea, we outpointed them with a delta of 17 points! But first let me say that Kaan Corbaci debut’d this match and had a shocker of a win defending with the black pieces against a straight-forward Guico Piano, his opponent fell for a pawn and his Queen was lost with a Kaan (Knight) fork. Congratulations to Kaan! Brian played the white pieces against the Sicilian defence, using the O’Kelley variation to achieve a Maroczy Bind. From the middlegame onward, the position reduced to a Rook and minor piece endgame, but Brian had superior pawns, his opponent having blocked and isolated pawns. Brian piled on the pressure, with his Rook and Knight dominating an inferior Rook and somewhat bad Bishop, and the position somewhat blocked. Through some confusion, his opponent allowed his clock flag to drop without making his first 30 moves, so he lost on time. But Brian was able to demonstrate a winning advantage to his opponent afterwards. 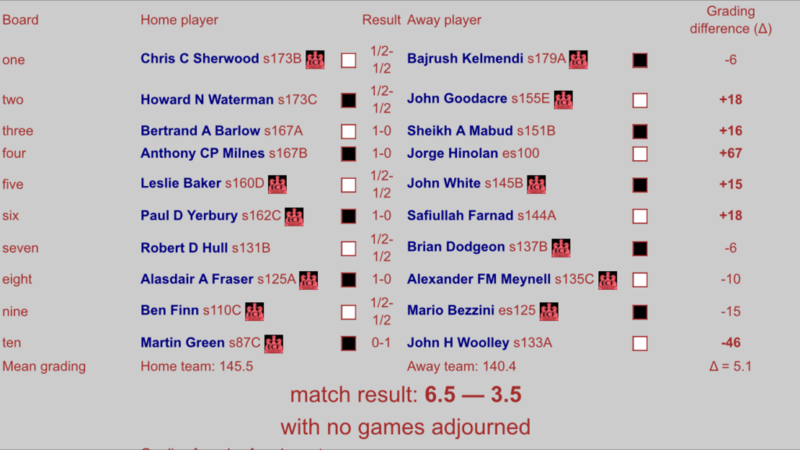 John Wooley achieved a creditable draw early on. My game was a disaster waiting to happen, after I thought I had trapped my opponent’s Queen with a poisoned pawn. But it wasn’t to be, alas, the Queen escaped and I was down 2 pawns, but then getting into time pressure, I lost the endgame (expletives deleted!!). Still, we won the match 2.5 – 1.5. Congratulations to the team! You’ve probably heard the cliché “a game of two halves”, well I think we need a new cliché for our loyal band of warriors in Division 4 as we look set to embark upon our “season of two halves”! As luck would have it, our first few games pitted us against the lower graded teams – and we certainly scored well there. But you can probably guess what that means – most of the big boys still lie ahead! The key task now is to step up to the plate and take down some of the big dogs. 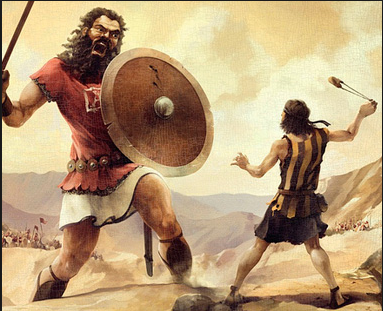 Remember what happened when David fought Goliath! Yeah, well, that was all very good in the Old Testament but things played out slightly differently in our hallowed theatre of Golden Lane as we face Lewisham. We went down fighting but unfortunately couldn’t prevent a narrow 3.5 – 4.5 defeat. Top performance though; we ran them right to the wire and I was proud of the guys who turned out for Hammer, giving away around 10 grading points per board on average. The night started pretty sweetly with fine wins for Marios and Brian on boards 1 and 2. Marios made short work of his opponent despite rocking up 15 minutes late. The art of intimidation obviously one of his strong suits. That, and a supported pawn on the 7th. His opponent was no slouch either – Mr. Stewart is averaging almost 180 for the season. I managed to catch Brian’s game just as the hammer came crashing down. BD’s Rook came marauding forward and pinned the Queen to the King. The instinct to immediately take must have been a strong one… before realizing that immediately setup a Knight fork on the unhappy royal couple. The instinct to lean forward and offer a hand of resignation followed promptly. 2-0 up. The next few to finish were all draws – Josue, Rich and yours truly. Fair to say we had attacking chances in all 3 but had to settle for half a point apiece. Rich was probably closest to finding the win, forging a really strong position before a momentary lapse allowed Gokhan back in and a draw was agreed. Very charitable considering Gokhan was a member of our own ranks last season! We were now 3.5 – 1.5 up. That’s seven games for Rich in Division 4 this season. He remain unbeaten with 3 wins and 4 draws, a record that perfectly mirrors that of Brian. They’re currently neck and neck in the stakes to be this season’s MVP. So, just a single positive result from the remaining three games would see us take something from the match, but alas, that final half-point wouldn’t come. Losses for John, Adam and finally, Ken, meant we ended the evening with nothing to show but a few hard-luck stories and empty pint pots in the Shakespeare. Despite sitting next to John I didn’t see much of his game, but hopefully it’s some consolation to learn that his “e130” opponent is actually averaging 167 for the season. Small matter of 6 wins out of 6. Adam’s run of bad luck in Division 4 continues – maybe it’s something to do with me. He faced the unconventional 1.b3 and was forced to make early concessions following a mis-step in controlling the c-file. He battled back only to fall foul to a sharp tactic causing him to lose a minor piece with little in the way of compensation. An honorable resignation followed soon after. Our final faller was Ken. I took up watching at one of the more unusual endgame positions I can remember in a while. Completely open, 3 passed pawns, at least 4 pawns en prise. The challenge was knowing what to do – attack or defend? Take a pawn and go for the win, or defend and try to consolidate? Ken chose to go for broke, but as the saying goes, discretion is sometimes the better part of valour. His opponent ended with a passed pawn in the centre supported by a Bishop – it’s destiny was clear. Unlucky. So a defeat, but a very honorable one at that. And I think it’s worth noting this is the strongest 2nd team we’ve ever assembled in Division 4. The future’s bright; the future’s Hammer. 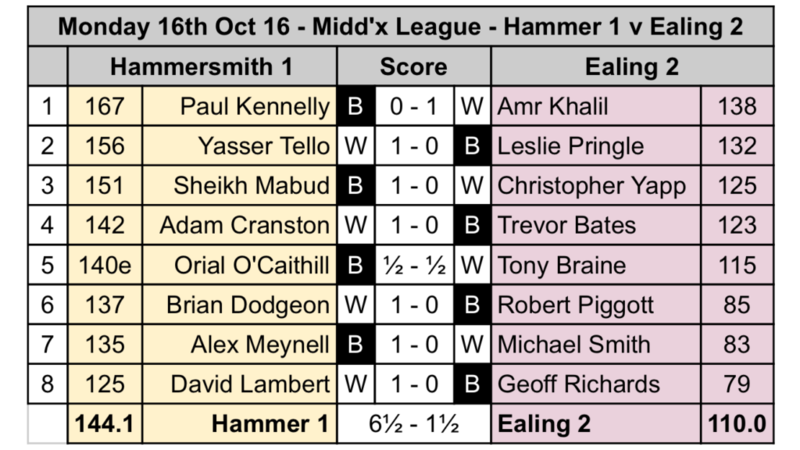 Monday 17th October could mean only one thing – the start of this year’s Middlesex League, at least as far as Hammersmith were concerned. Excited expressions were present across the faces of all who attended, as Lytton Hall was to play host to the might of Ealing 2. Having narrowly been relegated from division two last year, we knew we had something to prove. As such, many seemed surprised by my decision to rest four of our top five boards. However, with our opponents coming into the match in bad form, and having heard rumours about their possible starting lineup, I was confident our middle order would pull through. Play got underway at 7:30 sharp, and it was clear from the outset that both teams meant business. Sacrifices and zwischenzugs came flying across the boards at all angles, with spectators struggling to take their take their eyes off the boards to tend to their cups of tea. First to finish was Alex Meynell. An assertive “checkmate” coupled with an astonished yelp were audible from board seven. It was clear what had happened. Alex had slyly wound his opponent up in one of his infamous opening traps and turned the screw. His disappointed opponent left the hall after just an hour. Next up was board three. Sheikh Mabud, playing as black, faced Bird’s Opening (1. f4). After much deliberation, Sheikh decided he was not sufficiently up to speed with the notoriously double-edged From’s Gambit (1…e5!?) and instead responded with the main line (1…d5). Sheikh was further caught off guard by his opponent fianchettoing his queen’s bishop and attacking fast down the kingside. Sheikh held his nerve well. He proceeded to force tripled pawns on the g-file before coolly mopping them up with his rook. What followed can only be described as a meltdown from his opponent, who offered his hand in resignation before the time control. Yours truly was third to finish. After my last four games for the club with the black pieces, I was relieved to finally have the first move. 1. d4 g6 2. Bf4 Bg7 appeared on the board and it seemed my opponent was happy to sit back and allow me to play in my favoured positional style. It transpired that he was to be the architect of his own downfall. After firstly failing to castle behind his fianchettoed bishop, he developed his knight to d7 where it found itself trapped by my queen’s pawn and blocking in his light-squared bishop. Weakening his pawn structure with the premature a6 and h6 were to be the final straws; soon his poorly developed pieces were overloaded, and resignation came on move 25. Brian Dodgeon looked absolutely in control of his young opponent from the first move. His experience allowed him to gradually improve his material and strategic advantage, effortlessly negating his challenger’s attempts to attack down the queenside. Soon Brian’s passed f-pawn became unstoppable, and resignation was inevitable. Dave Lambert clinched the fifth win and victory for the team. With his opponent’s king boxed in on h8, he sat for a long time, calculating, trying to find an elegant smothered checkmate. With time running low, amazed at his inability to procure the elusive mate, Dave calmly switched plans, instead pushing home his material advantage in the shape of two strong central pawns. Fresh off the back of his dominant debut for the club, new member Orial O’Caithill was looking to maintain his 100% streak. Entering the endgame with two knights and five pawns each, Orial’s superior pawn structure and flawless technique appeared as if it was going to make the difference. With 20 minutes on his clock versus his opponent’s two, Orial hung a knight, gasping in frustration. Unwilling to trial his bullet chess skills, his opponent offered a draw, which Orial gratefully accepted. After two and a half hours of play, Yasser Tello had reached a dead drawn endgame. With each player having an almost identical pawn structure and one knight apiece, spectators were perplexed by his decision not to take the draw. Yasser’s ambition paid off – after some Carlsen-esque maneuvering and a couple of seemingly innocuous inaccuracies, his opponent suddenly found himself in zugzwang. Yasser’s king entered the black stronghold and ruthlessly mopped up the pawns. As the night drew to a close, everyone found themselves gathered around board one. Paul Kennelly looked to be dominating with the black pieces. He had a strong knight versus a weak bishop, and was pinning virtually all of his opponent’s pieces. As the inevitable time scramble commenced, calculation was out the window and instinctive mayhem ensued. Paul’s frustration was apparent as his opponent miraculously consolidated his position and won a pawn. A clever tactic sealed the defeat – white sacrificing his pawn with check to discover an attack on the black queen. All in all, a very good start to the season. Next up is Harrow 2 at home on 14th November, where we’ll hope to face a slightly stronger team but win by an even bigger margin! 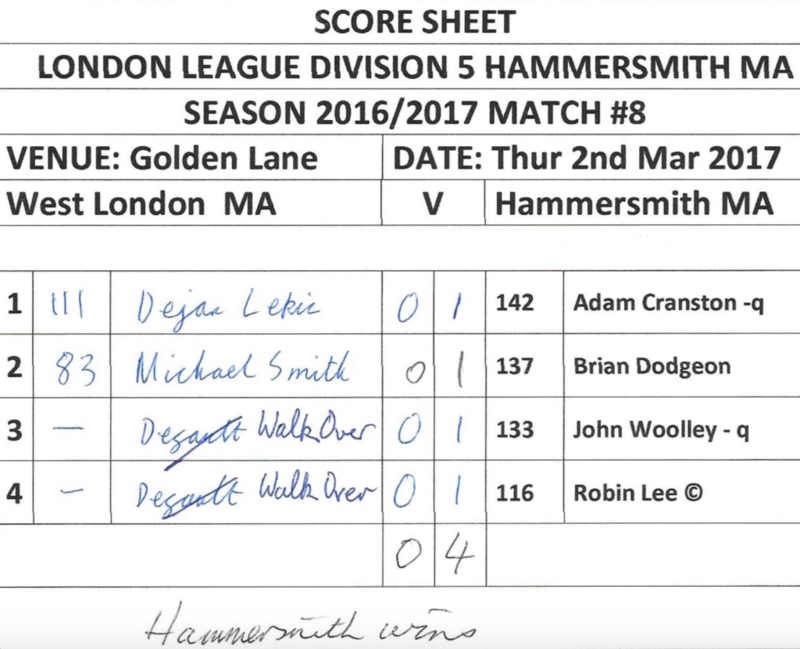 LL 3 – Tough Start for Hammer 1! Hammersmith went down 3.5 to 6.5 away to Cavendish in our opening match for the newly-promoted team. We really missed the experience of Paul Kennelly and Jeremy Hodgson owing to holiday and other commitments. However, new members Jay Hinolan and Matteo Bezzini stepped up to the plate. Jay suffered a loss in his first LL match – due to a heavy cold he was not in the best of form. He’ll be back stronger – having seen him beat Sue Maroroa in the simul during the Summer, I know he was well below his best here. 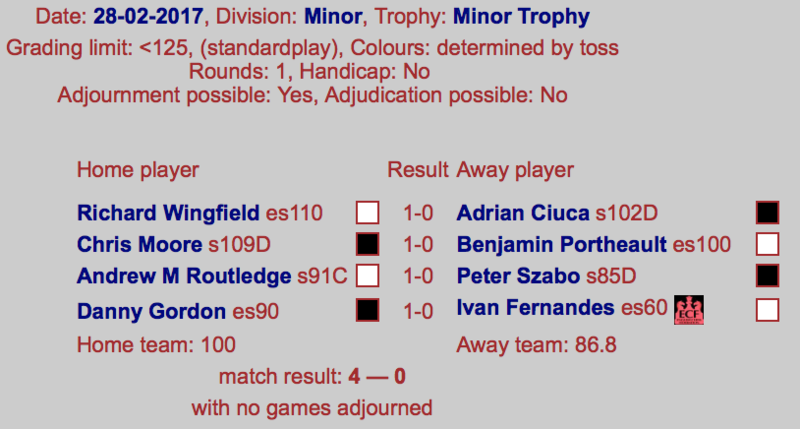 Matteo playing black got a draw – a solid start to his London League odyssey. Both of these guys will be great assets for Hammersmith in the London and other Leagues this season. Welcome aboard! To the rest of the games – the highlight was John Woolley’s return to form with an excellent win. Fighting draws from Brian Dodgeon, Bajrush, John Goodacre (great to see him back!) and yours truly. Sheikh, Safi and Alex all had tough losses – early season blues I think. A disappointing result but we were out graded by 15 points or more from boards 2 to 6. We’ll be back, and stronger next time! Full scorecard on LL site here. Author HammerPosted on September 30, 2016 September 30, 2016 Categories Games, Team CaptainsLeave a comment on LL 3 – Tough Start for Hammer 1! 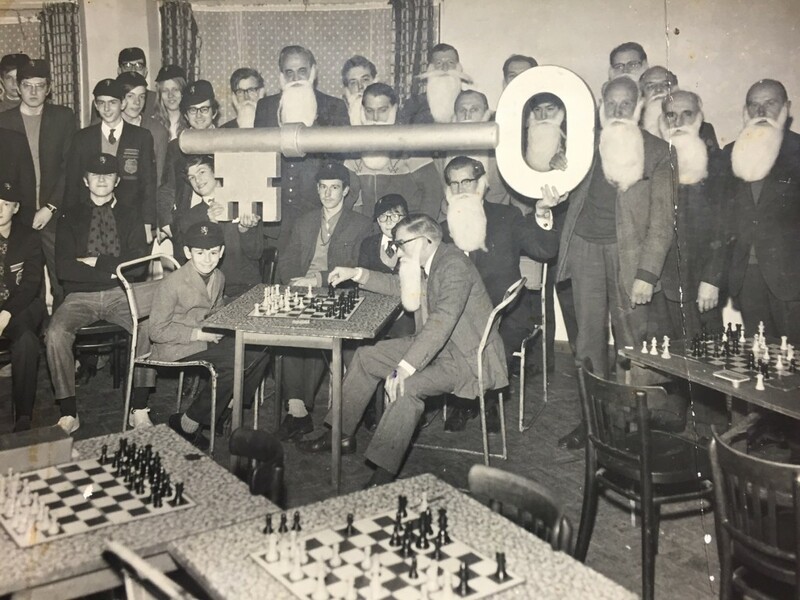 Hammersmith Chess Club has been around for a while – since 1962 to be precise. That might seem like the fairly recent past to some of you – perhaps even living memory for many of our members – however for those of us born after 1980 that is, quite frankly, a different era. Up there with pre-history for the millennial generation! To bear this out, indulge me for a moment while I recount some of the events that happened in Britain in 1962. The Beatles were yet to release an album. Hard to imagine a time before the Beatles isn’t it, but this was quite literally a pre-Beatles era. They had some of their first sessions at Abbey Road in 1962, and released their first ever single (Love Me Do) in October of that year. The Mark I Fort Cortina – launched the same year as Hammersmith Chess Club! 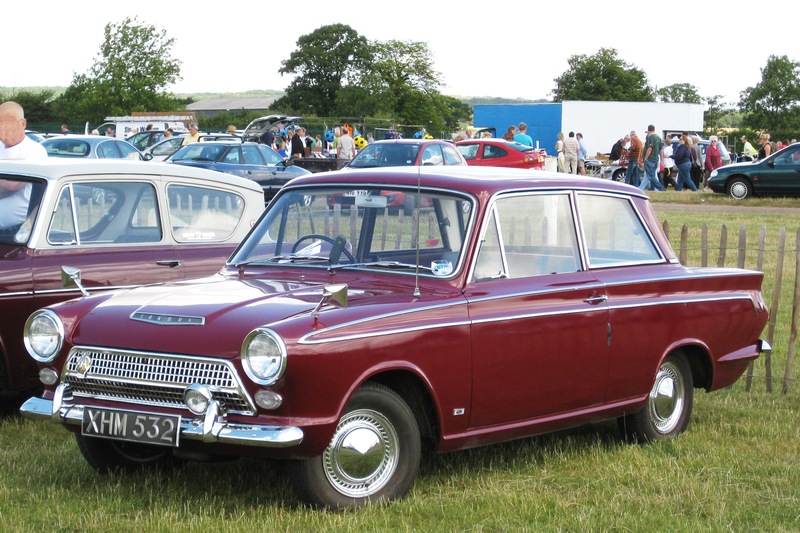 The Ford Cortina was launched – for the princely sum of £573 you could buy yourself a brand new Cortina! Other motoring options available at that time – the Vauxhall Victor, Hillman Minx (! ), and the Morris Oxford Farina. The first ever James Bond film – Dr. No – premieres, with Sean Connery playing the famous secret agent. Glad to see this is still going strong today, albeit without the schhhpeech impediment. Francis Crick, Maurice Wilkins, and James Watson win the Nobel Prize for their discovery of DNA – the building blocks of life! My point is, we have been around for a long time, and it’s only right that some of that history is recorded and shared. Luckily for us our ever-diligent club Secretary, Mike Mackenzie, recently re-discovered a treasure trove of historic material about the club whilst tidying up our equipment cupboard. As long ago as 1967 we were producing a regular newsletter for members. I’d like to share a few snippets and factoids from those fascinating records. 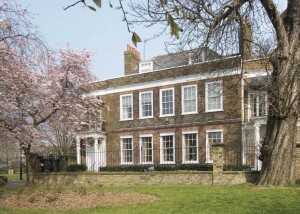 The Club first opened its doors on 3rd September 1962 at Westcott Lodge, now a Grade II listed Georgian House. Membership at the time was 22, including John White (made life President in 2012 to mark 50 years of the club) and Peter Martin (a long-time Treasurer and later Secretary of the club). 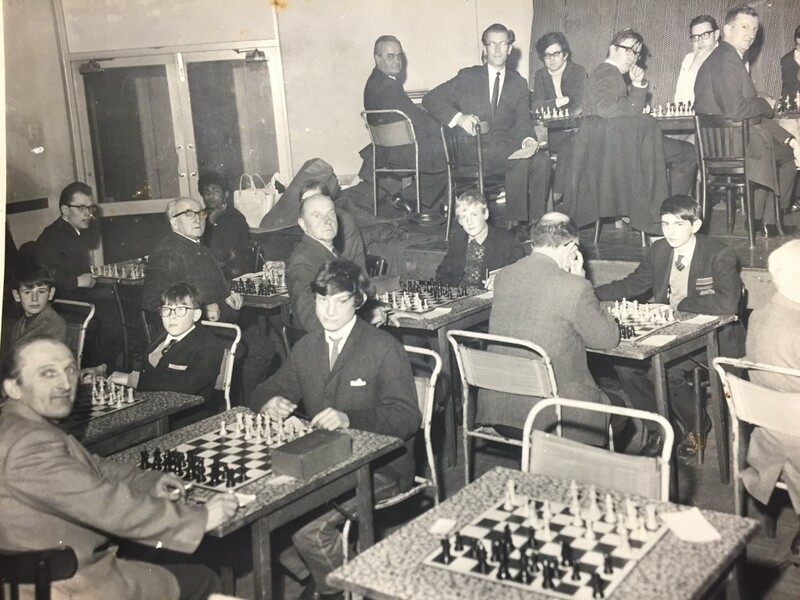 Hammersmith Borough Council (itself a throwback – now Hammersmith & Fulham Council) helped found the club, starting with an open chess competition in 1961 for which the council provided a handsome cup for the winner. Sometime after that competition, the council met and agreed the formation of Hammersmith Chess Club. It took some time to properly establish the club, and it wasn’t until 1966 that the club elected it’s first President, Lady Herbert. Lady Herbert was well known on the chess circuit at the time and something of a character. She was married to Sir Alan Patrick Herbert, himself a very interesting and erudite man – the club certainly had friends in high places! Membership had by then grown to 35 and cost around 30 shillings (£1.50!) – that’s right, Hammersmith Chess Club even pre-dates decimal money! 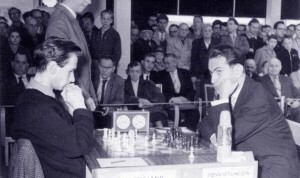 In July of 1968 Dr. Jonathan Penrose, British Champion, gave a simultaneous display at the club, winning 17 games and drawing 2. His fee was reported as 6 guineas (£6.30 in modern money). Given the level he played at, it is quite impressive that two club players managed a draw against the great man. At some point in 1968 our former President John White (back then just a regular member, one presumes) recorded a record 8th-straight victory in competitive chess, a club record! Sadly John is no longer with us, however his long-term contribution and dedication to the club lives on in the annual John White tournament – a handicap rapid play event we hold every Christmas. We were lucky enough to have John’s son present the trophy last year on the inaugural occasion of the re-named event. May 1968 saw the West London Open Junior (U-19) Championship, where several of Hammersmith’s most promising players competed. This included one Peter S Morton. Those of you familiar with the London club circuit will recognise Peter as an ever-present player. He stepped in as acting Chairman for us following John’s death, and is still an active player across the London Leagues. Also in 1968, our U21’s took on the over 21’s at the club. It sounded like a great match, finishing 8-8. Below photos document the event, which also made the local press! An impressive result from the juniors considering the youth of some on the team! 1970 saw the club move venue to St. Paul’s Church Hall, Sussex Place, having outgrown the premises at Westcott Lodge. I stand to be corrected, but I believe this is the church that you can see as you pass over the Hammersmith Flyover – the attached conference facility is now a RIBA-award winning architectural gem – oh to have our club nights there now! One wonders how the church and parish felt back in 1961 when the flyover was constructed! A frequent gripe of members at the time appears to be a lack of sufficient heating in the hall! Later in 1970 the club sent a team of seven players to Amsterdam to take part in a triangular match. I wonder how they got on – did the famous coffee shops exist back then?? The London Chess Congress Novice section in 1972 was won by a very young Hammersmith player. At just 9 years old, Julian Hodgson also won the Under 10’s prize – a pocket chess set. Julian would of course later go on to become British Champion. Interestingly, around this time there seemed to be a great deal of correspondence chess going on at the club. Hammersmith had a team in division two of the British Correspondence Chess League in 1973-74. In this era of online chess and smartphones, I was pleasantly surprised to discover that the British Correspondence Chess Association is still going strong! 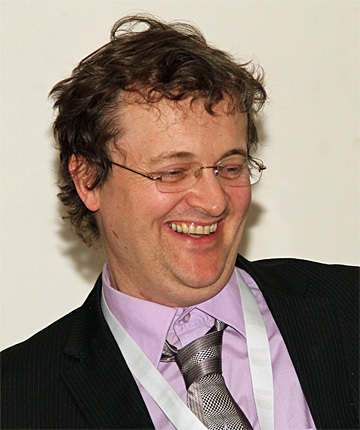 Dominic Lawson was the opponent for a Hammersmith player in a 1974 game in the Thames Valley League. A famous family name – Dominic is the son of former Chancellor of the Exchequer Nigel Lawson, and brother of T.V. chef Nigella. At some point around 1975 the club moved venue again, to Blythe Hall. This seems to have gone down very well with the members – much warmer than the church hall! Drunken Knights club get their first mention around this time too. Pleased to say they are still going strong as well! Our chess book library commenced in 1975 too. The first title to be loaned out – “Yearbook of Chess 1969/70”. The library continued through the rest of the decade and up to 1984 when our final title went on loan – “100 Chess Gems”. Good times. The 1980’s are short on detail in the archives, but we do have our first mention of Ken Hedger in 1983, as captain of our third team in the Hammersmith League. Ken is another regular on the London chess scene, and is still an active player today, some 30+ years later. March 1996 the club finally received money through from it’s insurers for rain damage to our boards! The record isn’t entirely clear how this happened but it was very well received! Carsten Pedersen also gets a mention for the first time – Carsten is currently the strongest player at the club. John Wooley took over captaincy of our Thames Valley team in 1998, successfully seeing the team through to promotion to Division 1. John is another stalwart of the club and still plays strong chess in the Thames Valley league today. 1999 sees the last entry of note in the archive, but it’s a good one! Our in-house tournament that year was won by Michael Bushill. More notable was the 3rd placed player – CJ De Mooi. You may have heard of CJ – a long-time fixture on the BBC quiz show Eggheads, he’s also appeared on Countdown, Fifteen to One, and numerous other shows, as well as having a successful modelling and acting career! His life is not without controversy too – have a read of his Wikipedia biog here. The late 2000’s saw Sue Maroroa on the books of Hammersmith. 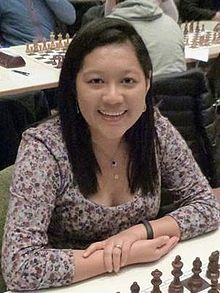 Sue has had a distinguished chess career, including earning the title of Woman International Master, with a victory over GM Mark Hebden to her name. She was the strongest player at our club whilst a member. As you can see, it’s been an interesting 54 years since the club first opened its doors. Times have certainly changed since then, but I wonder if the game itself has changed much in those years? Over the next few weeks we’ll be putting up some of the games from the archive newsletters so we can have a look to see for ourselves. See you soon! I’ve only been playing competitive chess for a few years – one season for Denton whilst in Manchester before joining Hammersmith in early 2012. Back then I wasn’t thinking about captaining a team. I was happy to just turn up and play. I’ve been a captain now for approaching two full-seasons so thought it might be interesting to double-back on that throwaway comment and see if it carries any weight. 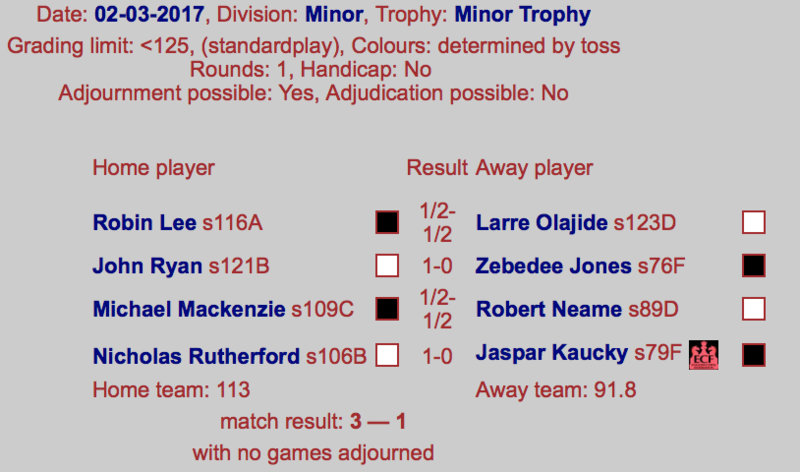 I finished the 2014 season on a grade of 127, and at that time took on the mantle of captaining our team in London League Division 4. It’d be a challenge: our team was likely to be graded in the 140-80 range and yet we’d regularly come up against teams with a 120-130 on bottom-board; a 175 on Top Board wasn’t altogether surprising either. Still, it was about getting games and ensuring that we were able to follow-through on providing league chess for our newer members. The season was a difficult one – even factoring-in the other matches outside the league, I ended the season on 34%. My Jan’15 grade was 117 and my final-year grade was 121 – a total of 6 points lost like-for-like. But fast-forward a few months and I was back up to 126. All things considered, I’m not sure there’s much in it. The more cynical amongst you may argue I didn’t have that many grading points to lose in the first place! Once I’m in the midst of a match, I tend to knuckle down and concentrate on my game – I’m not sure it’s much of a burden. The biggest stress I have is wondering whether my 8 players are going to turn up! That broad smile you see at 6:59pm in Golden Lane, when the last player rolls through the door, that’s a real one!! Author HammerPosted on February 15, 2016 February 20, 2016 Categories General Chess, Team Captains1 Comment on Oh Captain! 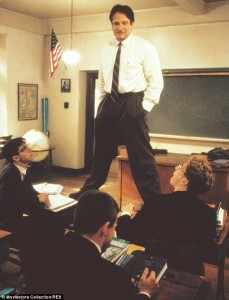 My Captain!